3.7 billion light years away, a star in the Leo constellation collapsed into a black hole emitting a huge beam of gamma rays. This showered Earth with its largest recorded gamma ray burst although it is the second brightest optical flash ever detected from such an event. “The burst topped the charts in terms of duration, number of gamma ray photons, the energy of the gamma ray photons, total explosion energy, and radiance.” – Paul Hertz, director of NASA Astrophysics Division. The dying star had an estimated mass to the order of 30-100 times that of our Sun. Its implosion sent out high-energy gamma ray beams with the equivalence of 25billion electron volts or 500,000 times the order of our Sun’s energy. In death, the blackhole formed has between 1-10 times the solar mass. Named GRB 130472A, the star’s blast emissions reached Earth on April 27. Initial emissions were registered by the Fermi Gamma-ray Space Telescope in low Earth orbit. Fermi’s Large Area Telescope recorded 20 hours-worth of the cosmic rays as they were emitted through the universe. The previous record for such an emission was 100 minutes. An 80-second flash from Leo constellation prompted the Rapid Telescopes for Optical Response (RAPTOR) in Los Alamos to observe and analyze the event. The data collected during this event has motivated further investigation into the death of stars and blackhole formation. “We have to the drawing board and understand the physics of blast waves moving close to the speed of light and how they generate particles of very high energies and generate magnetic fields. One thing at this point is certain – a lot of theories will have to work hard and go beyond our current understanding to accommodate these results.” – Paul Hertz. 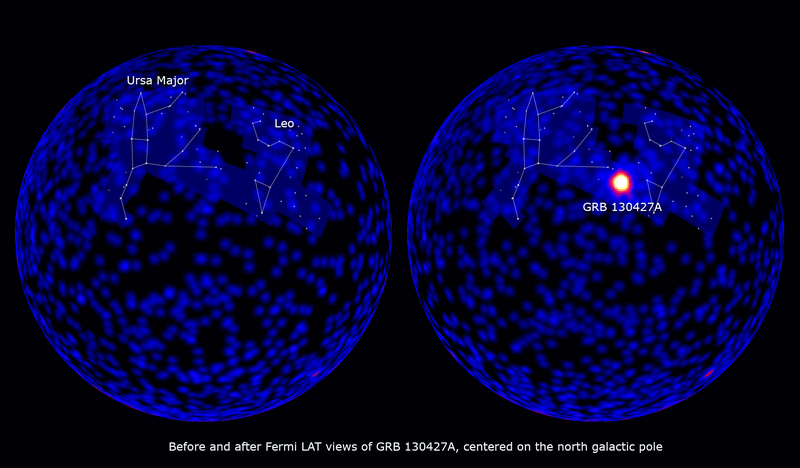 Earth was in the path of rays emitted by GRB 130472A. This event was however not bright in universal terms. If chance had it that an event of GRB 130472A’s magnitude happened in our own galaxy, Earth would have been affected directly. Gamma ray bursts carry the potential to harm life to the level of extinction. Theory suggests that around 450 million years ago the Ordovician–Silurian extinction event decimated masses of marine species on Earth. This might have been caused by a nearby supernova. Chuck Dermer, an astrophysicist at the Naval Research Laboratory, however explains that this theory can be disproved. Emissions similar to those from GRB 130472A generally occur in sparsely populated galaxies. Such galaxies contain relatively few stars which in turn have low metal content. The Milky Way is safe in this aspect with much higher metal content. Our galaxy therefore appears have much lower rates of stars that emit gamma rays as they die. GRB 130472A did produce a brief but noticeable effect on our planet’s ionosphere.